So it really is tough to come up with new banana bread recipes that I haven’t shared with you guys. I swear this blog could be titled the Banana Bread Blog : ) But with a bunch of brown bananas, I was up for the challenge. I had motivation too! We had our last week of tennis lessons at the park district, and I wanted to bring sometime to say thank you to our pro. I also wanted something to serve to our overnight guests this past weekend. This first recipe adds in one of banana’s favorite companions. Chocolate! With chocolate swirled throughout, it makes a beautiful marbled bread and also a great gift! I was only sad that I couldn’t dig right in. It seems wrong to bring a loaf of bread as a gift with a slice missing! While bread number one was cooling, I got started on making my second loaf. Since I’m a huge gingerbread fan and still have robust molasses in the pantry, I was excited to use it again. This bread smells delightful and puffs up beautifully! I was thankful to be able to slice off a bite to try. I am a huge fan of this flavor combination! This bread froze well and I loved eating another slice smothered with almond butter yesterday. Both breads looked and smelled wonderful! Perfect to heat up these cool end of winter days! 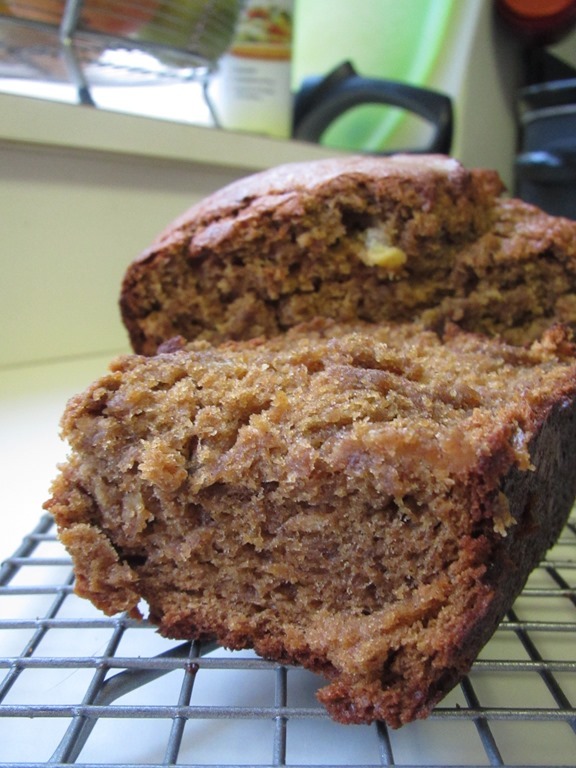 Here are more recipes from the Banana Bread Blog. What do you do with your brown bananas? In a mixing bowl, whisk the flour, baking soda, and salt together. Add sugar and butter to a large bowl and beat with a mixer at medium speed until well blended. Add banana, eggs, and yogurt; beat until blended. Add flour mixture and beat at low speed until just blended. Melt chocolate chips in a microwave or in a double boiler, stirring until smooth. Add 1 cup batter to chocolate, stirring until well combined. Spoon chocolate batter alternately with plain batter into a greased 8½ x 4½-inch loaf pan. Swirl batters together using a knife. Bake for 55-60 minutes, or until a wooden pick inserted in center comes out clean. Cool 10 minutes in pan on a wire rack, then remove from pan and cool 10 minutes before serving. Preheat oven to 375, and grease a loaf pan (or you can use 3 mini pans). Combine flour, sugar, ginger, baking powder, baking soda and cinnamon in a large mixing bowl. Mix in banana, butter and molasses until well blended, about 2 minutes on medium speed. Stir in eggs until well combined. Pour into loaf pan and bake for 55-60 minutes or until a toothpick comes out clean. Cool in the pans for about 15 minutes, then continue cooling on wire racks. When completely cool, gently spoon powdered sugar into a wire mesh strainer, and shake the strainer over the loaves to garnish. Whoa! That looks tasty! I’ll have to try it sometime. I seriously think I can smell that bread from here!!! Looks so amazing!!! You probably can! Stay warm this week! LOVE both of these. The swirl is gorgeous! Banana goes with EVERYTHING when it comes to bread but chocolate is one of the best. I love a good swirl bread! The marble is gorgeous; I wonder how it tasted? And I love that you gave baking to your tennis instructor! That would be the most thoughtful gift to unexpectedly receive! Thanks! I’m sure she was surprised but said it was delish! OHHH MY. These look amazing. Lately I have been saving ALL THE BROWN BANANAS for the mango smoothie I posted today. SO GOOD. Oh I always keep frozen mango in the freezer and am counting down the day until fresh mango is available : ) Brr it’s still damn cold right now! Love the thought of molasses in there, yum!! Does it mask some of the banana flavor? I’m usually more of a zucchini or blueberry bread person but this sounds awesome with the molasses combo! Yes! It is not a strong banana flavor at all! You could up the spices too and you’d never know because they jsut add sweetness! Any time! I’m sure there will be many more banana bread recipes to come! I hope you find some time this weekend to bake up some breads! Enjoy! Thank you! Drool Away! I’m hoping to do some more baking this weekend too! OMG! Banana gingerbread! 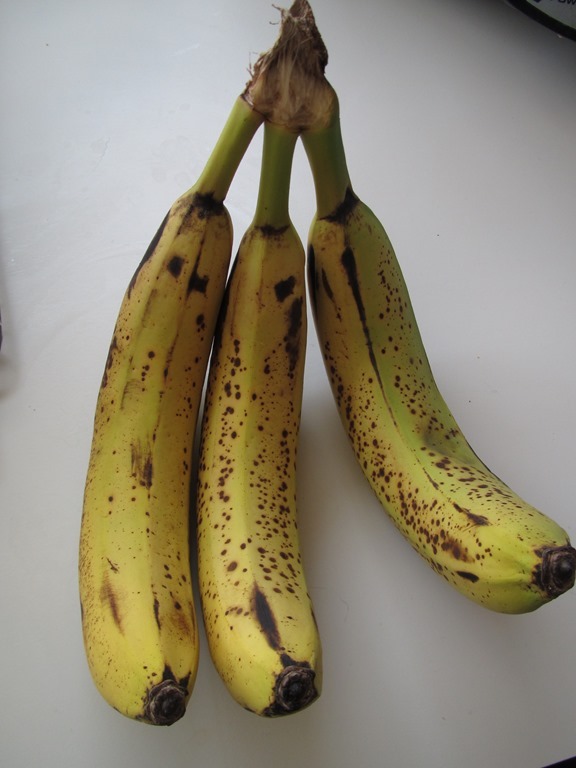 I’ve been freezing brown bananas lately to use in my Osmo recovery smoothies… SO good! So good and I love banana fro yo too! Frozen bananas have lots of good options!